We are very proud to present you our latest innovation, the Baldur 300 superior. More power, more quality, more music enjoyment. This highest - class product emphasizes the excellent basic properties of the Baldur 300 even more. Provided with a first class high capacitive condenser bank and a premium high accurate output multilayer transformer with access for 4, 6 and 8 ohms this unit is more than first - grade. The multiplicity of accesses offers new possibilities in the use of different speakers and provides an even bigger scope of musical space. 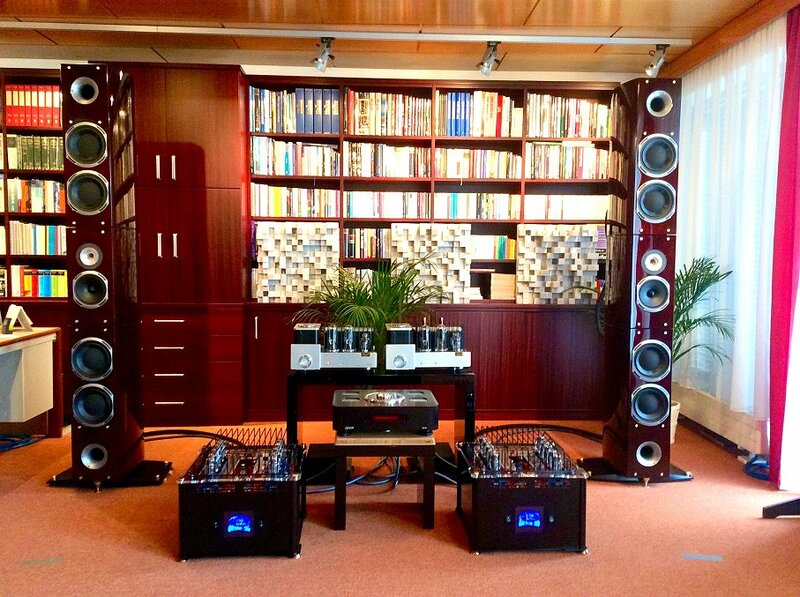 The exorbitant high power breaks a new world with an unprecedented sound, quality and pleasure to the listener. More than 15 years of experience have leaded to this excellent product which trumps even the excellent functions of his predecessor, the Baldur 300. The distinguished technique is even more improved and filed. Only the best, expensive, highest quality components were used. Of course all amenities of the Baldur 300 as well as the beautiful design were retained. The Baldur 300 superior is available from summer 2011. 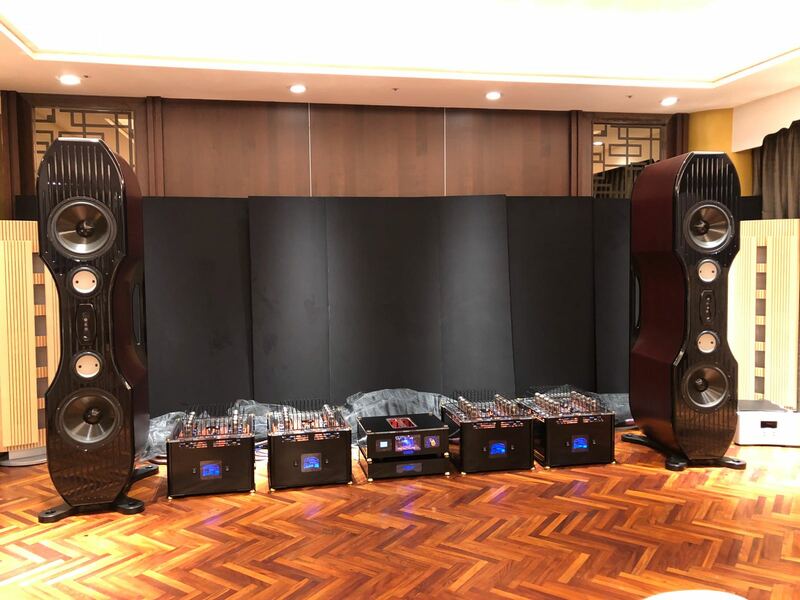 We have spared no pain and expensive to provide you with this amazing delicacy of musical quality whose overwhelming sound and power will definitely express you. Convince yourself! 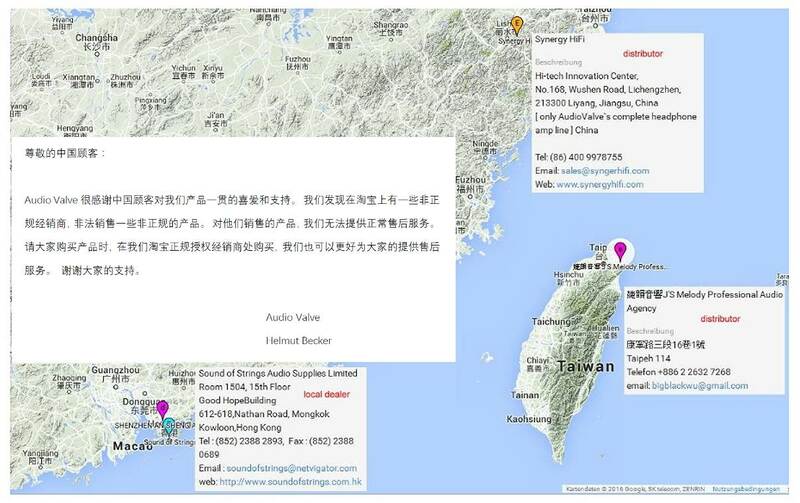 Nous sommes tr�s fiers de vous pr�senter notre derni�re innovation, le Baldur 300 sup�rieur. 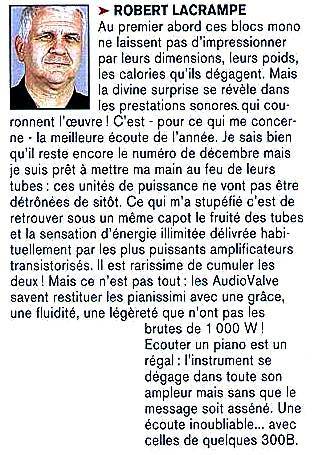 Plus de force, plus de qualit�, plus de plaisir de musique. Ce produit de classe le plus haut accentue les excellentes propri�t�s du Baldur 300 m�me plus. Nanti d`une premi�re classe banque de condensateur haut capacitive et un transformateur sup�rieur de multicouche de production haut exact avec connexion pour 4, 6 et 8 ohms cette unit� est plus que premi�re qualit�. La multiplicit� des connexions offre de nouvelles possibilit�s dans l'utilisation de diff�rents haut-parleurs et une encore plus grande espace musical. Le haut performance exorbitant ouvre un nouveau monde � l'auditeur - avec un son, une qualit� et un plaisir sans pr�c�dent. Plus de 15 ans d'exp�rience ont conduit � ce produit excellent qui surcoupe m�me les fonctions excellentes de son pr�d�cesseur, le Baldur 300. La technique prestigieuse est m�me plus am�lior�e et sophistiqu�e. Seulement les composantes meilleur, ch�res et de la haute qualit� ont �t� utilis�es. Bien s�r tous les avantages du Baldur 300 aussi bien que le beau design ont �t� garder. Le Baldur 300 sup�rieur est disponible � partir de l'�t� 2011. Nous n'avons pas compter le peine y mettre le prix pour vous offrir cette d�licatesse de qualit� musicale dont le son et performance �crasant vous exprimeront sans doute. 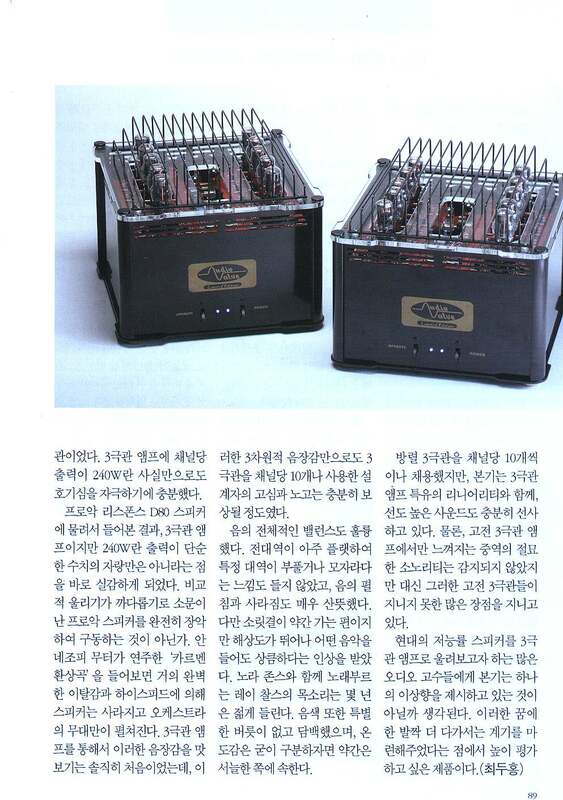 The test of the Baldur 70 monophonic blocks done almost one year ago has pleased us, their price not being over 4000 � the pair, putting them in the leading group of best deals in amplifiers with tubes linking generous available power (80 W RMS) and musical qualities due to the optimal use of the double triodes 6AS7G. On this limited series, the beauty, the sounds refinement, as well as the natural of the stereophonic scene reaches even higher while referring to the same sonorous politic. The few 240 W RMS available bring on the voices, the piano as well as on the most various sounds a sonorous field, an even more valuable support, such as the Baldur 70 but better everywhere. The spectral balance appears very slightly decreasing towards the shrill is not a default. We get used to it so well that going back to common electrical seem to go towards an excessive luminosity. A complete success at a studied price which will charm the melanomists. At first look these mono blocks impress quite by their sizes, their weight, the calories that they release. But the divine surprise is revealed in the sonorous performance which top the work! It is � on my opinion � the best hearing of the year. I know that there is still the December edition but I am ready to put my hand in the fire of their tubes: these power units will not soon be dethroned. Which surprised me the most, was to find under the same cover the fruity of the tubes and the unlimited energy feeling usually provided by more powerful transistorized amplifiers. It is extremely rare to combine both! But it is not all: The AudioValve know how to restore the pianissimis with grace, fluidity, lightness that the stronger one of 1000 W do not have! Listening to a piano is delightful: the instrument is released in all its width and without the message being strike. An unforgettable listening� with one of some 300B. Who can claim to know the world of tube amplifiers, if they do not know the AudioValve products! These unique music-technical jewels in tube technology, hand produced by AudioValve, signify and prove, as hardly any other like product, that the technically viable in terms of quality and reproduction can be accomplished. Maximum effort combined with virtually unlimited investment in development reached its peak, the new design �BALDUR 300� in the BALDUR line, available in 2005. 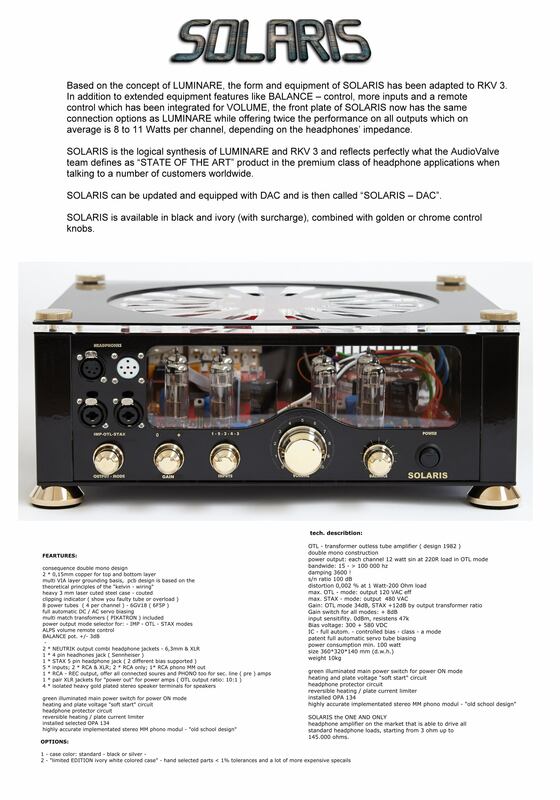 As a result of this investment, AudioValve offers an ultimately refined and unique state-of-the-art tube amplifier weighing of 55kg which has a justifiable top position in the category �power triode class - tube amplifier�. But really, is there any other triode power amplifier in this top category apart from BALDUR 300 with an output of nearly 240 watt sinus at 1% distortion? 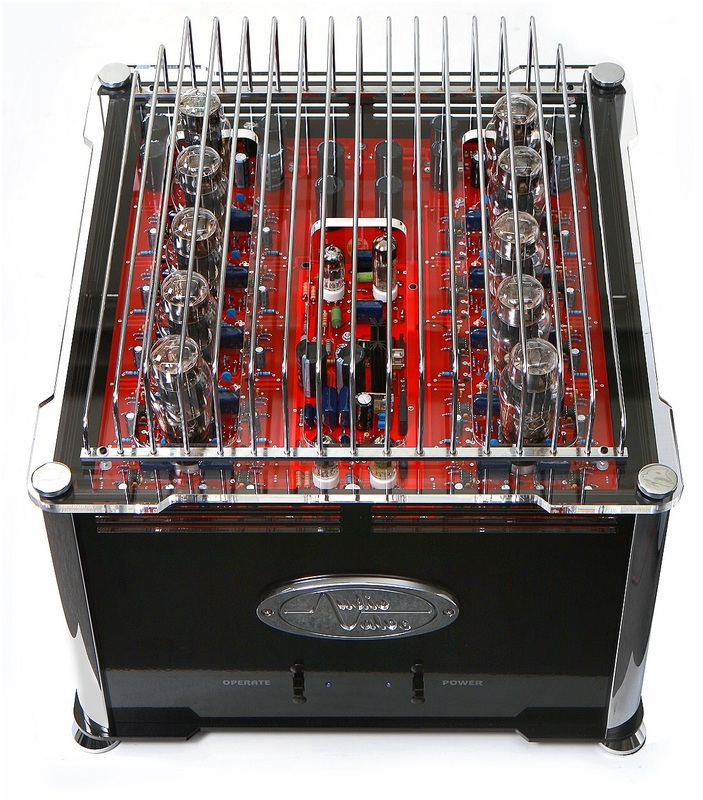 Sophisticated design and technology form a harmonious symbiosis which is reflected in its outstanding reproduction characteristics coupled with an incredibly high operational reliability for tube amplifiers. 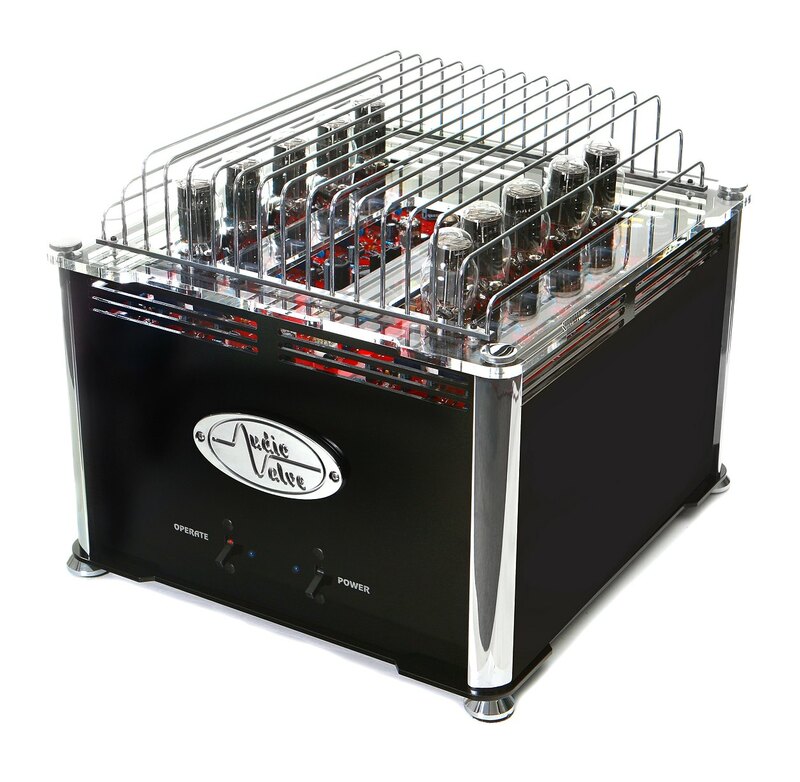 Auto-Bias regulates, controls and safeguards protective circuits and a further 800 components in the amplifier thus making the BALDUR 300 virtually indestructible. The exchange of tubes or reconnection of loudspeakers during operation are things which only can be done with BALDUR � or have you ever tried to disconnect a loudspeaker from an amplifier during operation at a High-End trade fair and managed to leave the hall before the booth staff could kill you? With BALDUR 300 the listener acquires a piece of German High End history written by a man who - as no other � has created his own ideas regarding tube amplifiers with untiring strength for decades in an unorthodox but brilliant, competent and qualified way, who promptly and ingeniously puts his experience gathered over decades into action in all product series made by AutoValve and in the BALDUR 300 of course. A product which in every respect is totally committed to the principle � Made in Germany� and which you and your grandchildren will enjoy for decades. An encounter with BALDUR means feeling the difference � no ordinary tube amplifier boasts of being a relic of past times. An encounter with BALDUR is an encounter of a special kind . This encounter eliminates your fear of tubes and gives you the feeling of superior reliability, never ending power and endurance. Very soon you will begin to appreciate, love and enjoy the charismatic features and time after time be enchanted by the charm of BALDUR. Even the Baldur 200 had legendary characteristics. BALDUR 300 with almost double the power will definitely continue this trend. When is your date with BALDUR? 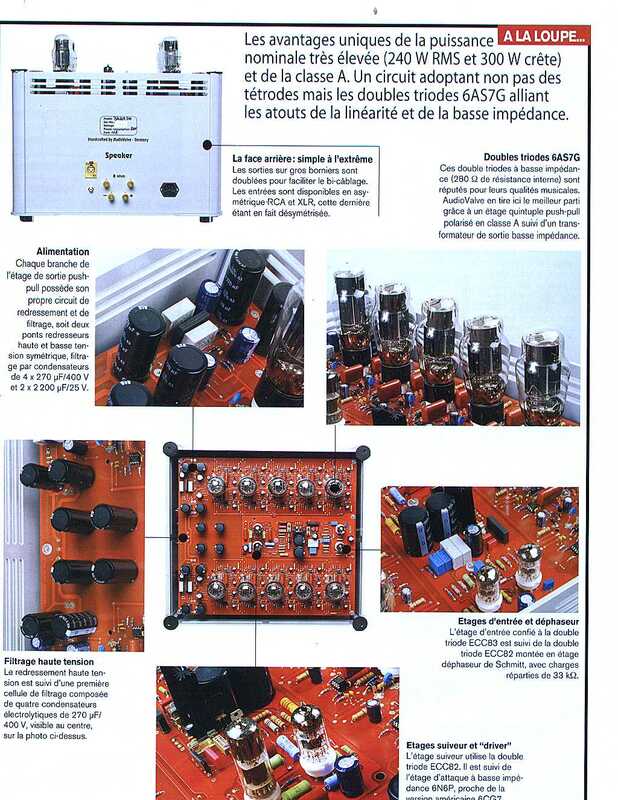 Qui peux bien dire, qu`il conna�t le monde d`amplificateurs tubes quand il ne conna�t pas les produits d`AudioValve! Ces unique pierreries musicale-technique dans la technologie de tubes, produi dans la manufacture AudioValve, affirment et consolident comme gu�re un autre produit comparable que le technique jouable d`apr�s qualit� et rendu est vraiment r�alisable. Avec un grand effort et un investissement �norme de travail d�veloppement la s�rie BALDUR � disponible d�s 2005 � se termine par le nouveau design avec le nom �BALDUR 300�. En tant que le r�sultat de cet travail, AudioValve livre le sous forme d`ultimatum, raffin� et comme en un seul bloc fabriqu� �state-of-art� amplificateur tube. 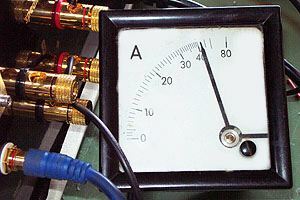 Avec un poids de 55 kg c`est amplificateur a d�j� aujourd`hui un premi�re place au cat�gorie d`�amplificateurs power triode classe A�. 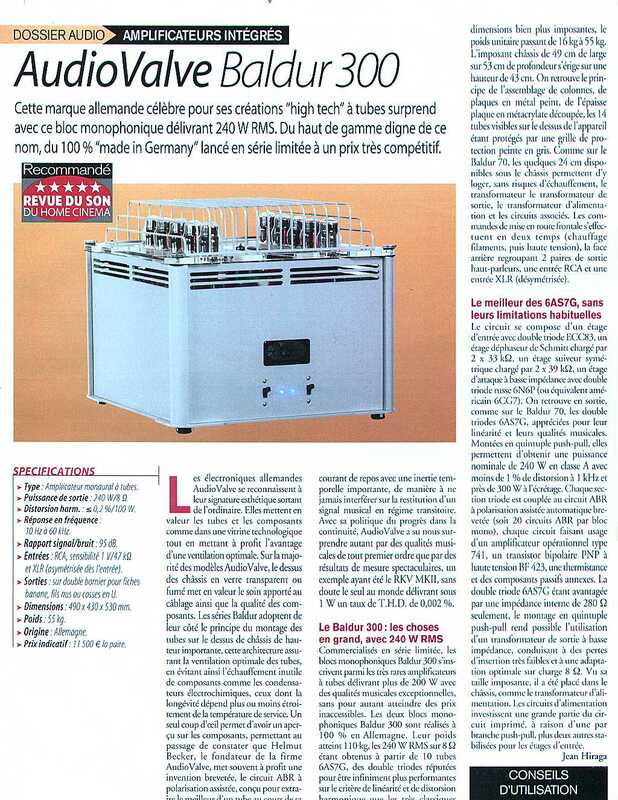 Mais quel amplificateur triode fait d�j� performance dans cette classe supr�me, � part de Baldur 300 avec pr�s de 240 Watt Sinus-puissance de sortie au 1% cliquetis. Des constructions complot� et le technique compose une symbiose harmonique, que se r�fle dans une caract�ristique de rendu surplombant et un s�curit� d`exploitation qui est insolite pour un amplifiacteur tube. 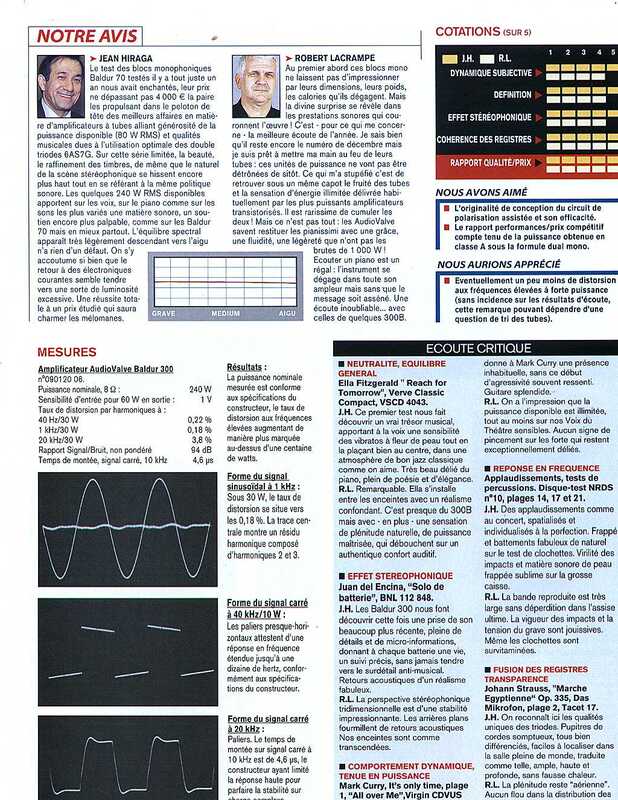 Par exemple des Auto-Bias, des connexions de s�curit� et des autres 800 composants r�glent, commandent et assurent l`amplifiateur. Comme ca, le BALDUR 300 est pour ainsi dire �increvable�. Changer des tubes dans l`activit�, reconnecter des haut-parleurs etc. � tout ca sont des choses que vous pouvez faire seulement avec le Baldur. 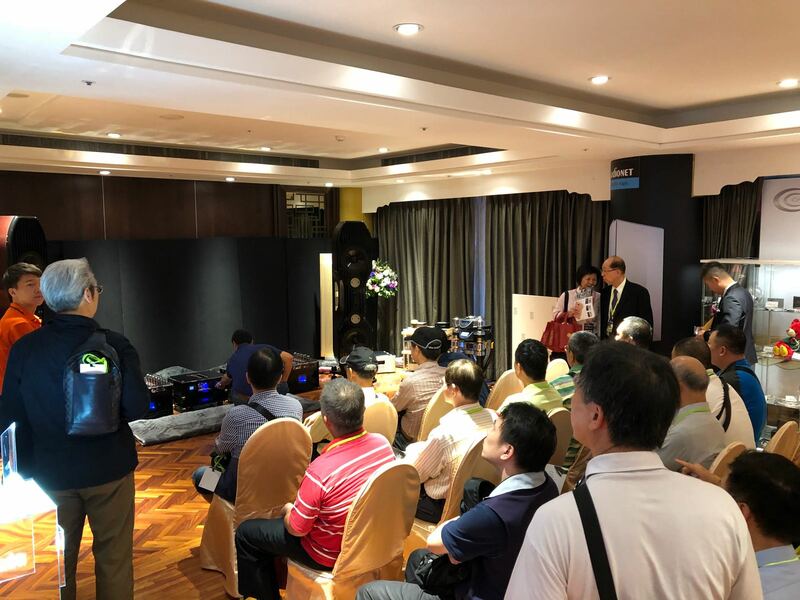 Ou avez vous d�j� coup� l`activit� d�s haut-parleurs de l`amplificateur dans un High-End-foire sans vous attirez des ennuis dont le personnel du stand? Avec le Baldur 300 l`auditeur ach�te une pi�ce d`histoire High-End allemande, �crire d`un homme qui a, comme gu�re un autre, concu ses id�es au sujet d`amplificateurs tubes pendant des d�cennies. Avec un engagement inlassable, g�nial et boh�me, comp�tent et qualifi� il a realis� son exp�rience cr�e pendant les d�cennies g�nial et actuel dans toutes les s�ries d`AudioValve � bien s�r aussi dans le Baldur 300. Un produit qui vraiment gagne le principe �Made in Germany� et � vous et votre petit-fils aurez sa joie encore dans des d�cennies. 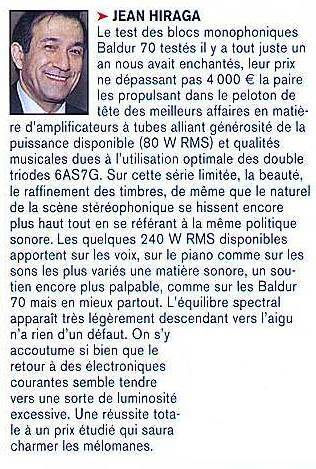 Quand vous rencontrez le Baldur, vous sentez que Baldur est diff�rent; pas un amplificateur tube banal qui se vante de �tre une survivance des temps pass�s. Baldur est un rencontre de la mani�re particuli�re. Il prenne � vous la peur des tubes, il vous procure le sentiment de la fiabilit� souveraine et jamais la force finissant et endurance. D�j� bient�t vous commencez d`appr�cier, aimer et d�guster cette propri�t�s charismatique et vous vous faites enchanter sans cesse sur nouveau par le charme de Baldur. D�j� le Baldur 200 poss�dait les trains l�gendaires, mais avec le Baldur 300 et la force approximativement double se trend va continuer irr�vocable. Quand avez-vous votre date avec Baldur? � nominal output: 240 watt sinus - 1% distortion at 8 ohm load. 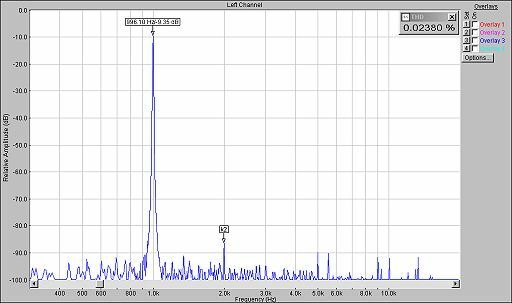 Wir Ihre Balduren 300 ausgiebig an unserer Triangle Grand Concert mit einem Ayon CD3s (mit eingebauter Vorstufe) getestet und mit unseren bestehenden Cayin 9088 (2x845/Block) sowie den NAT Transmittern verglichen. Mittlerweile testeten wir die Baldur 300 Monos am 8 Ohm Anschluss - anstelle der 4 Ohm - mit der Triangle Grand Concert und sind hellauf begeistert, jetzt ist der Klang viel pr�ziser und alles war wie gew�nscht und wie unten bereits positiv beschrieben. Die Balduren sind also elektrisch der beste Antrieb, den wir bisher an dem LS geh�rt haben und das waren ca. 10 Endstufen. Meine Frau, die ja analytischer h�rt als ich, l�sst Sie sch�n gr�ssen, und meinte dass Sie die beinahe eierlegende Wollmilchsau eines Verst�rkers gebaut h�tten und Sie ist von Ihrem K�nnen schwer beeindruckt. In diesem Sinne bedanken wir uns sehr herzlich, Sie haben uns sehr geholfen und uns eine grosse Freude bereitet!